Once you have bought a house, one of the problems you may face relates to plumbing issues. When water starts leaking below a concrete slab in your home, this is known as a slab leak. If not addressed in good time, such leaks will pose serious health risks and ultimately weaken the supporting structures of your home. This is why it is important to have your systems inspected so as to identify these problems. However, there are a number of signs you can look for to detect the problem, understand the specific causes and know where exactly the leak is. 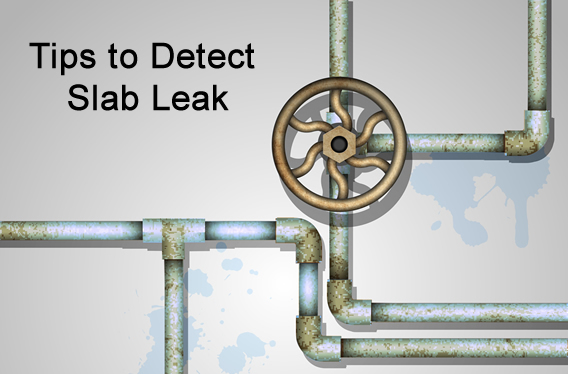 Here are a few slab leak detection tips. Warm or wet spots on your floor could be an indication of a leaking slab. While issues such as a shower near the slab or a leaking valve on the bathroom sink could cause such spots, it will still be important to identify the source of the problem. A leaking or broken hot water line underneath the slab could mean something serious. If you hear sounds of running water when you are sleeping at night and the house is quiet, you could have a leaking slab. The problem tends to produce a hissing or splashing sound in the walls. One of the best ways to determine whether you have a leaking slab is to close all the running taps in the house and listen to any sounds of water running on the walls. If you notice that your water bills have increased without any understandable cause or increase in consumption, you should suspect a problem in your plumbing system. Since such a leak may be difficult to see with the naked eye, you should think about hiring a plumbing expert to inspect the system and identify any possible problems. Failure to repair such issues may lead to damage to your property as well as huge financial losses. In some cases, a leaking slab may result in cracks and movement of the foundation of your home. In case the problem is not detected and repaired in good time, leaking water from the underground pipes will move downwards. After some time, the water will find its way through the slabs and reach the foundation. Since water can affect the structural integrity of your home by interfering with the overall stability of the building, you should contact professionals who know how to repair plumbing issues as well as a foundation. Some of the reasons why you may experience low pressure of water include a buildup of minerals in the pipes, faulty valves and debris in the water. However, there are times when the problem will be as a result of a leaking slab. If you are to find the exact cause of the problem, you should run water so as to identify the locations that have low pressure. You can then call in an expert to address the leaking slab. If you have leak detectors installed in your meter, they will be very important in slab leak detection. If the leak detector is moving or spinning, there is a good chance that you have a leak somewhere along your plumbing system. A professional plumbing company will not only diagnose plumbing problems but also repair your lines. In case of a leaking slab, they will have the expertise and equipment to repair any damages. However, with the health risks and serious structural problems that slab leaks are associated with, it is critically important to know the red flags to look for.